The request for reexamination will be denied if a substantial new question of patentability is not found based on patents or printed publications. If the examiner concludes that no substantial new question of patentability has been raised, the examiner should prepare a decision denying the reexamination request. Form paragraph 22.02 should be used as the introductory paragraph in a decision denying reexamination. 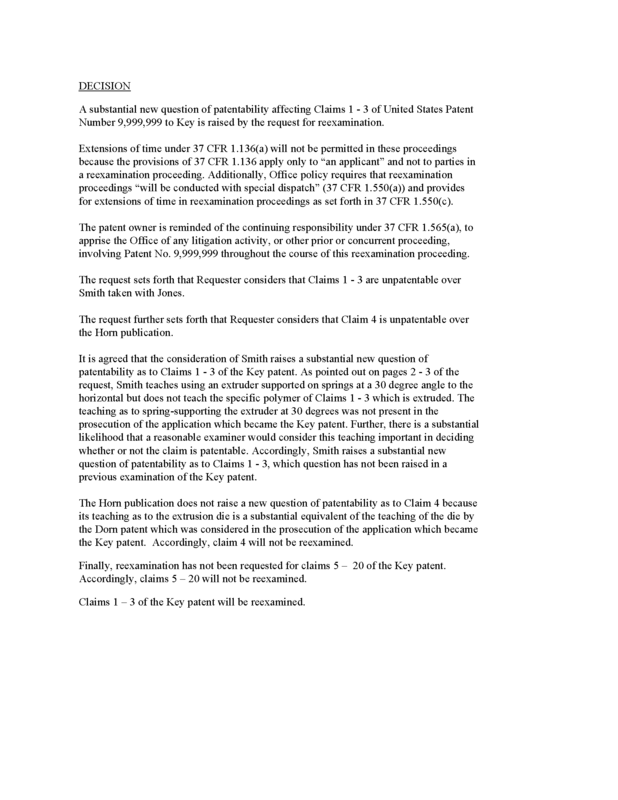 No substantial new question of patentability is raised by the request for reexamination and prior art cited therein for the reasons set forth below. (D) One which was cited in the record of the patent and is barred by the guidelines set forth in MPEP § 2242, subsection II. A. The examiner should also, in the decision respond to the substance of each argument raised by the requester which is based on patents or printed publications. If arguments are presented as to grounds not based on prior art patents or printed publications, such as those based on public use or on sale under 35 U.S.C. 102(b), or abandonment under 35 U.S.C. 102(c) for reexamination proceedings examined under the first-to-invent prior art regime, the examiner should note that such grounds are improper for reexamination and are not considered or commented upon. See 37 CFR 1.552(c). The decision denying a request for reexamination is processed for mailing by the Central Reexamination Unit (CRU), and the CRU will allow time for a petition seeking review of the examiner’s determination refusing reexamination. 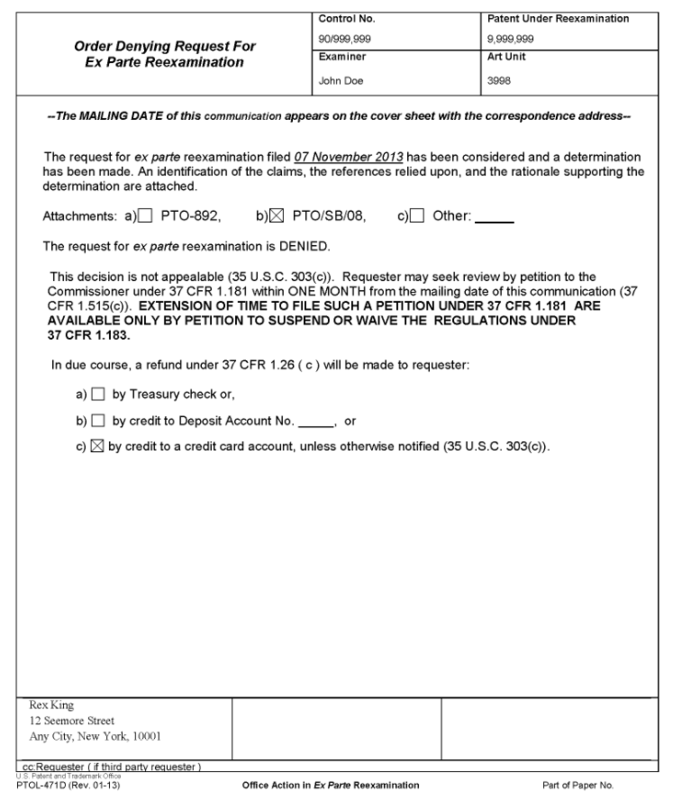 If such a petition is not filed within one (1) month of the examiner’s determination denying reexamination, the CRU then processes the reexamination file to provide the partial refund set forth in 37 CFR 1.26(c) (the Office of Finance no longer processes reexamination proceedings for a refund). The reexamination proceeding is then given a 420 status. A copy of the PALM “Application Number Information” screen and the “Contents” screen is printed, the printed copy is annotated by adding the comment “PROCEEDING CONCLUDED,” and the annotated copy is then scanned into IFW using the miscellaneous letter document code. 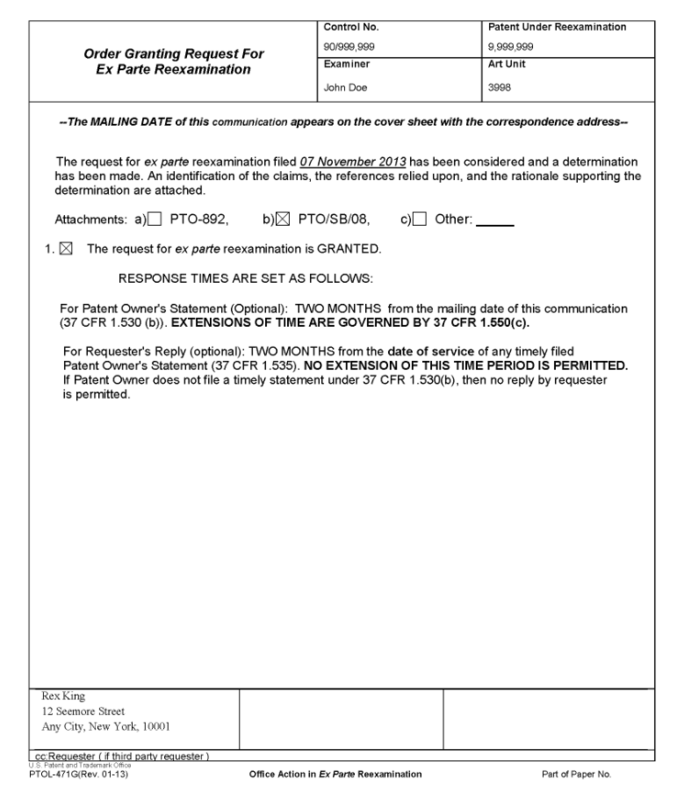 The concluded reexamination file (electronic or paper) containing the request and the decision denying the request becomes part of the patent’s record. If the examiner’s position is to deny reexamination, the examiner will prepare for and set up a panel review conference as per MPEP § 2271.01, to discuss the issuance of a decision denying reexamination. The examiner may prepare the decision after the conference, or may prepare the decision and revise it as needed after the conference. The conference will be conducted. If the conference confirms the examiner’s preliminary decision not to grant reexamination, the decision denying reexamination will be completed and signed by the examiner, with the two or more other conferees initialing the action (as “conferee”) to indicate their presence in the conference. A transmittal form PTOL-465 with the third party requester’s address will be completed, if a copy for mailing is not already available. The transmittal form PTOL-465 is used to forward the decision to the third party requester. The use of this form removes the need to retype the third party requester’s address each time a mailing is required. In conjunction with the mailing, any appropriate processing (e.g., PALM work, update scanning) is carried out by the staff of the CRU. 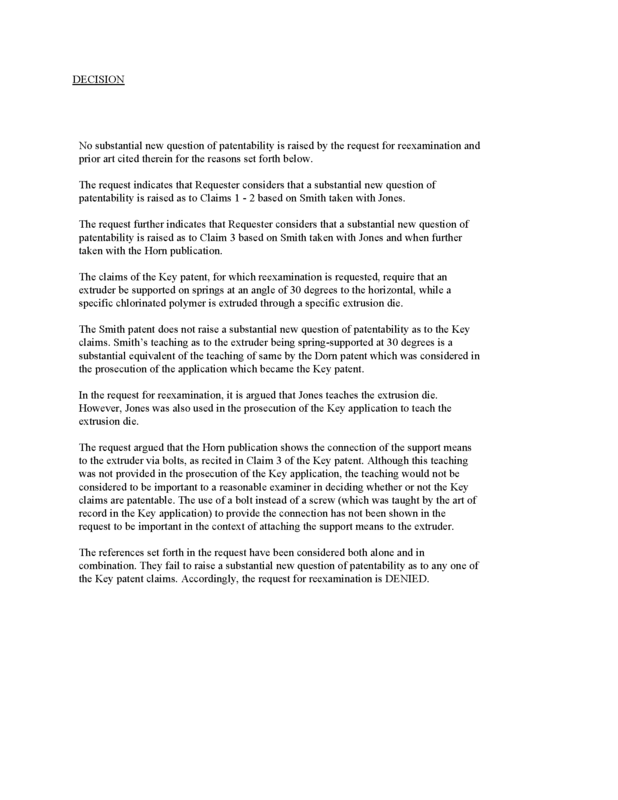 Examples of decisions on requests for ex parte reexamination are provided below. The first example is a grant of an ex parte reexamination. The second example is a denial of an ex parte reexamination. The examiner should leave the paper number blank since IFW files do not have a paper number.